Point One Marketing Ltd claim to have had screening processes in place, but that those processes didn't work or that the data they used overrode any TPS Registrations. If you have opted in data from a supplier and the user subsequently registers on the TPS, then the TPS registration overrides the opt in. Conversely, the opposite is true if they opted in after they registered on the TPS. The ICO was concerned that Point One Marketing Ltd had not undertaken any due diligence checks on the data they were purchasing to ensure it was opted in to receive such calls. The ICO was further concerned that the company was failing to operate a proper Do Not Call (DNC) list to suppress numbers of consumers requesting not to be called again. "...given that the Company relied heavily on direct marketing due to the nature of its business, and the fact that the issue of unsolicited calls was widely publicised by the media as being a problem. It is therefore reasonable to suppose that they should have been aware of their responsibilities in this area." Point One Marketing Ltd admitted to having problems with their data supplier, yet they persisted in using them until the ICO intervened. "Reasonable steps in these circumstances would have included carrying out due diligence checks, screening the data against the TPS register and its own internal suppression list (DNC)..."
The Commissioner was therefore satisfied that Point One Marketing Ltd had not taken reasonable steps. 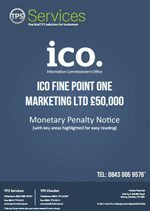 Point One Marketing Ltd were fined £50,000.